With soft pastels and understated style, this classic design is suited to a variety of events. Design: Overlapping pastel letters spelling "Baby". 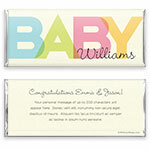 Personalization: Front name, back title and message.